Happy Friday! 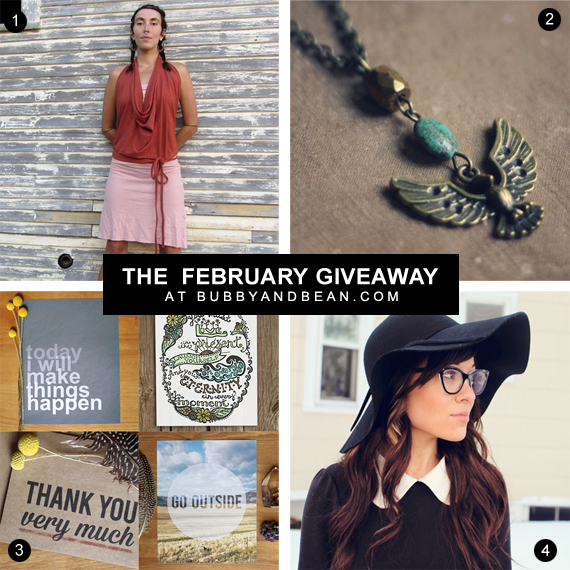 It's time for this month's big giveaway, which features some truly fantastic goodies from several of Bubby and Bean's February sponsors (and Bubby and Bean Art is getting in on the action too). One lucky reader will win everything you see here, valued at $220. 2. A handmade Eagle Vision Necklace from ROOTS AND FEATHERS. $20 value. 3. A $30 Shop Credit from BUBBY AND BEAN ART. $30 value. 4. One month Large Ad Space from LITTLE TREE VINTAGE. $40 value. Visit any of the shops from this giveaway (Roots & Feathers // Gaia Conceptions // Little Tree Vintage // Bubby & Bean Art) and list your favorite item(s). Favorite any of the shops from this giveaway on Etsy (Little Tree Vintage // Gaia Conceptions // Roots & Feathers // Bubby & Bean Art). This giveaway runs through February 27th and is open to Bubby and Bean subscribers worldwide. The winner's name will be chosen randomly and announced shortly after. IMPORTANT: Please make sure that you check back after the 27th and/or that there is a way to contact you through your entries in case you are the winner. Thanks again to our February sponsors for contributing such rad prizes! Good luck! Really wouldn't mind having that Migration Tunic! Ooh! I follow on Bloglovin and would love the apron top! The credit to your shop please!! ;-) I have wanted some new cool prints for a while! The eagle necklace is gorgeous too! I would love to win the credit to your shop! I could use some awesome prints! I love your shop, so my favourite is the store credit! What a collection!! i would just love the Gaia wrap top, But all are amazing! I like the There is Beauty in Simplicity 8x10 Art Print - Charcoal Gray Simple Typography Art Print at Bubby and Bean. I subscribe to (Gaia Conceptions by email. I'd love to win the wrap top for my daughter! Thanks for the chance. Now following Gaia Conceptions via tumblr with username 2Byoutify. I follow Little Tree Vintage via GFC. I follow Bubby and Bean via Instagram (@2justByou). I'm a B&B fan on fb. I already re-tweeted your tweet today. Does that count for the tweet? The Anoki Pant from Gaia Conceptions is gorgeous! Thanks. I favorited Roots & Feathers on Etsy (pixiepine). I follow you on Twitter (veganpixiestar). I would love to win the Eagle Vision Necklace! I`d Love to win Number 3 then i could buy some of the amazing valentines cards! I love the longhorn. a bohemian cowgirl breastplate necklace from Roots and Feathers! How creative! I would most like to win the Eagle Vision Necklace. I'd love to win the Eagle Vision necklace! My favorite prize is the store credit! My favorite item from Little Tree Vintage is the floral painted pots! So pretty! Loving the Eagle Vision Necklace from ROOTS AND FEATHERS. After perusing the BubbyAndBean Etsy shop, this is definitely my choice. I am a sucker for a piece with a great quote, and there are so many from which to select. I would love the Eagle necklace. I love the Gaia Concepts top! I'd loved to win the necklace! I would like the apron wrap top...follow on bloglovin as labellaluna. I'd like to win the wrap top. I would love to win the apron top. Or any of the items! All amazing goods! I follow through GFC. I favorite B&B on Etsy. Favorite item from B&B etsy is Go Outside art print. Favorite item from roots and feathers etsy is the Moongazer necklace. Favorite item from Little Tree Vintage is the Pac Man Printed Blouse. I follow bubby and bean gfc! I am a bubby and bean facebook fan! I'd love that eagle vision necklace! I love the Eagle Necklace! I'm a subscriber, and I'd love to win the A $30 Shop Credit from BUBBY AND BEAN ART. Thank you! I love the "Go Outside" art print. I favorited B&B Art on etsy (kitscherie). I like Bubby & Bean on FB. i follow you through GFC. And i'd love to win a $30 Shop Credit from BUBBY AND BEAN ART. I love uncloudy day. a baby blue and brown jasper and deerskin necklace. Totally the Apron Wrap Top!